In the Special Edition, January 2011 issue, of the Islamic Post an ayah from the 60th chapter in the Holy Quran, Sura Mumtahana (60:3), was explained for it more appropriately displays an Islamic perspective as concerns the treatment of Non-Muslims. Currently Islamic sentiments in this regard are negatively portrayed by an often misrepresented ayah from another chapter; Surah Tauba (9:5) in which it is frequently translated as “kill all infidels”. Also mentioned was the fact that in order to truly understand the Quran, a multifaceted approach is necessary and part of that entails an understanding of the “asbabul nazul” or reason for revelation of the individual parts. The danger of taking an ayah and simply disseminating the words face value is that misunderstandings are created. In truth this is done on purpose for these very misconstructions are tools used by the agencies of hate that exist worldwide. These evildoers are not only attempting to extinguish the light of Islam, but to also destroy the pillars of all religions. As all mankind is the family of God we must not sit idly by and allow these agents of hate to be successful. In light of that, if the true meanings of this Islamic holy script, the Quran, are elucidated and disseminated, then appropriate insight into the inner meaning of Islam can be achieved and the animosity that has been created between religions—especially Christianity and Islam—can be eliminated. That being said it would be helpful to expound on the reason for revelation of this repeatedly misread ayah. Although this subject is very extensive, an attempt will be made to cover the breadth of it in a two part article starting with the historical aspect and a discussion to follow in part two. In the grand scheme of things Sura Tauba was revealed at a time when Hazrat Muhammad (peace and blessings be upon him) had attempted to make the customary pilgrimage (Hajj) and was denied entry into Mecca by the largest opposition to the Muslims, The Quraysh. In order to propagate the true peaceful essence of Islam, the Muslims Divinely entered into a treaty with many of the leading tribes of Arabia including these very same Quraysh. Part of this Treaty of Hudaibeya stipulated that all sides were not to war during a specified period of time especially during the holy months where there was to be no aggression at all. The year after this proclamation was signed Hazrat Muhammad (peace and blessings be upon him) made Hajj as stipulated by the treaty. Simultaneously one of the allies of the Muslims (tribe of Khuza'ah) was attacked at night by one of the allies of the Quraysh (tribe of Bakr) with the assistance of the Quraysh. The Khuza’ah informed Hazrat Muhammad (peace and blessings be upon him) of the attack and he secretly prepared to war against the Quraysh as per Heavenly order. The leader of the Quraysh, Abu Sufyan, after previously witnessing Divine assistance being with the Muslims and being concerned the treacherous actions of his tribe would lead to war, tried to make amends but was unsuccessful. 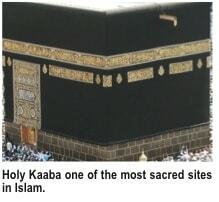 The Divine result of this breach of treaty, was the conquest of Mecca shortly thereafter at the hands of the Muslims. This was the end of a long line of broken pacts that Hazrat Muhammad (peace and blessings be upon him) and the Muslims had endured due to the dishonor of the Non-Muslims of the Arabian Peninsula. Thus Divinely inspired, Hazrat Muhammad (peace and blessings be upon him) did not enter into any more treaties and the Heavenly proclamation came down that the Arabian peninsula was to be united under the banner of Islam so all Non-Muslims had to go elsewhere. Owing to the Islamic ideas of what is just and humane—and in keeping with the merciful character of Hazrat Muhammad (peace and blessings be upon him)—doing something of this caliber without allowing sufficient time was considered inappropriate. So for all the particular categories of Non-Muslims, appropriate time limits were granted, except for the Quraysh who it was determined reprieve was not to be given due to their treachery. Appropriately ayah 5 was revealed in which it says: “So, when the sacred months expire, kill the ‘Mushriks (one who associates partners with God) wherever you find them. And catch them and besiege them and sit in ambush for them everywhere.Then, if they repent and establish Salah and pay zakat, leave their way. Surely, Allah is most Forgiving, Very Merciful” – (9:5). So this ayah particularly applied to a specific subset of people in a particular time. Although the Holy Quran was created to apply to all peoples of all times the particular examples it uses to accomplished this have to be completely elucidated in order for one to form the appropriate conclusion about what is being said. In part two we will delve a little further into the subject to enhance the comprehension of this often discussed part of the Holy Quran. And as always, Only by God, the Almighty and All Glorious, can we be healed!